INTERVIEW | For many, the murder of Altantuya Shaariibuu was the turning point. For them, a line had been crossed. They could put up with the systemic discrimination, the corruption and the religious interference. They could justify all this for the need for stability and racial harmony. However, this murder, the subsequent cover-ups, the mendacity of the government, the collusion of the security apparatus, but most of all, the political personalities linked to this butchery, was a realisation that any semblance of morality was drained from the state. For me, besides the numerous deaths in custody, the death of Teoh Beng Hock was my turning point. In this interview, ES Shankar, author of the provocative Murdered in Malaysia: The Altantuya Story, makes his case that there is something truly rotten in the state of Malaysia. Thayaparan: If I said that this book is the equivalent of the Oliver Stone film on the murder of JFK (John F Kennedy), would I be wrong and if so, why? Shankar: No, you wouldn’t be far off the mark. My intention is to smoke out the rats before more people and evidence disappear... Any book like mine will have its supporters and detractors. Controversy is inevitable where the full powers of the state are being marshalled to suppress the truth. I would like to think we are better than America, which has shamefully allowed a president to be assassinated with no closure on who gave the orders. Like the JFK assassination, the Altantuya murder reeks of conspiracy. There are none so blind as those who will not see. Just to be clear, what conclusions can we draw from this book? There are several crimes which all are, of course, related. 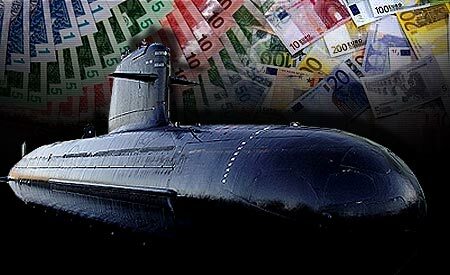 The RM7.5 billion DCNS France-Malaysia Scorpene contract signed by Najib Abdul Razak as defence minister in 2002, was an allegedly inflated deal in which payment of RM575 million “coordination and support service fee” to Abdul Razak Baginda’s Perimekar is reckoned by most to be a sham arrangement. Ultimately, that inflated cost was borne by the Malaysian taxpayers. How much else was allegedly siphoned off through fake invoicing and kickbacks is anyone’s guess. In February 2016, Razak Baginda also admitted that he had received RM137 million (euro 30 million) in “consultancy fees” from DCNS Group. He has been accused of being a traitor for selling state (naval) secrets. Things are a bit murky here as Razak Baginda appears to have been a late entrant in the Scorpene contract negotiations. A former employee of Thales (25 percent shareholder of DCNS), a Malaysian, Jasbir Singh Chahl, claims to be the original architect of the Scorpene deal. In 2002, he sued Razak Baginda for RM50 million compensation. The case was quietly settled out of court. So, Razak Baginda has every appearance of being someone’s nominee. Then we have Altantuya’s gruesome C4 murder, the starting point of which was her alleged blackmailing of her ex-lover, Razak Baginda. Ex-inspector-general of police Musa Hassan said that he had submitted his report to the attorney-general stating who he thought had the primary motive to have her killed. One can’t see who else that person could have been other than Razak Baginda. Lastly, we have the cover-up. Who had the power to allegedly order the change of judges, manipulate change of counsel, spirit private investigator P Balasubramanium off to India with 48 hours of his statutory declaration (SD1) in which he claimed Najib had an affair with Altantuya, etc? 1. 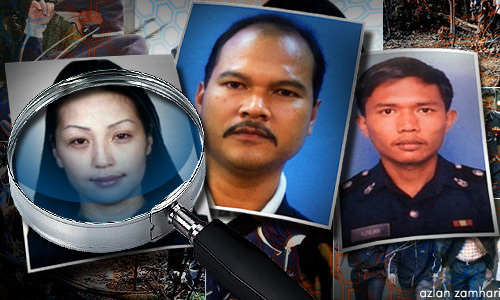 Police officers Azilah Hadri and Sirul Azhar Umar may have pulled the trigger, but the orders came from someone else, particularly as Altantuya was a total stranger to them. They had no motive whatsoever to kill her. It looks like Sirul may have been set up to be the sole fall guy. But eventually, both were convicted at the High Court for murder. 2. 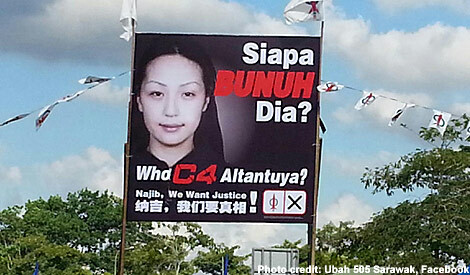 The use of C4 to blow up Altantuya’s body suggests a darker motive. Was she carrying someone’s child? Sirul’s confession (disallowed in court) says she was. 3. According to Deepak, PI Bala was coerced into withdrawing his SD1 and substituting it with SD2. Why would he lie when he claims he had been fronting for many years for their businesses and had a “sisterly” relationship with Najib's wife, Rosmah Mansor? 4. So, the conspiracy goes all the way to Putrajaya. The lack of willpower by the IGP, AG or Najib to order the investigation to its logical conclusion, i.e. to identify the person(s) who gave the orders to kill Altantuya, is telling. Sirul told the police of a RM50,000 or RM100,000 reward for the contract. It defies belief that there were no follow-up questions by the police as to who had offered that money. Prima facie, there is obviously some kind of cover-up, I think everyone can agree with that but, how do we as a nation – regardless of political affiliation – confront this tragedy when our institutions and political parties are compromised? Because of your blog posts and writing that are clearly anti-Najib, how do you convince people that this is an objective examination of the murder of Altantuya? I repeat I am not anti-Najib per se. All my blog posts on Najib-related scandals – Altantuya, 1MDB, Felda Global Ventures Holdings, Felda, Eagle High Plantation investment, East Coast Rail Line, National Higher Education Fund, etc., – ​​​​​​​are fact and figure based. I have also blogged on many of the scandals under Dr Mahathir Mohamad and Abdullah Ahmad Badawi and other ministers and politicians. Again, I challenge anyone to dispute my writings based on facts. Putting aside emotion and political bias, what’s their objection? Critics of the book claim that it is essentially an electorate poison pen letter to the Najib regime. What is your response to that? I have never been anti-government or anti-Mahathir or anti-Najib per se. I have never met Najib and have no personal axe to grind with him. My grandfather and father before me voted BN. So did I until the Anwar Ibrahim case. If the IGP and AG will not go after the person who allegedly gave the orders to murder Altantuya, and there is no response on it from the highest public office in the land, then it can only mean one thing – Sherlock Holmes and “whatever remains, must be the truth”! Have there been any conversations between Harapan politicians and you about this book or the murder of Altantuya? None. I wanted no interference from anyone or accusations that I had been paid to write this book. It is entirely the fruit of my own effort with no collaboration from anyone. What have been the repercussions of writing this book? Have you been threatened by the state? Have you been exposed to the kind of harassment that some activists have claimed they have received from the state? I can’t go much into this as it involves the security and safety of innocent acquaintances, friends and family members. But suffice to say that the authorities have been making inquiries. Once the agreement was signed to publish the book in a marketing tie-up with Sarawak Report, I left the country in September 2015 with barely time to pack my bags. Since then, I have been away from home, which of course, I miss badly. But I am no hero and I was not going to be a sitting duck for the government like PI Bala, who is now dead. Besides, as Anwar lamented, there’s not much you can do from behind bars. The freedom away from home has allowed me the time and opportunity to continue with my crusade against murder, injustice and endemic corruption in Malaysia.